There was a good turnout of society members at NAPEX held in Washington D.C. at the McLean Hilton June 1-3, 2001. The Society of Indo-china Philatelists (SICP) shared a table with the Military Postal History Society (MPHS) throughout the show. 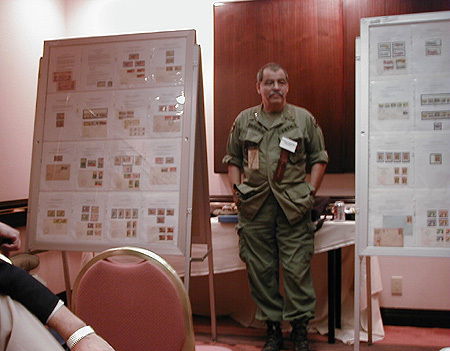 One of the weekend highlights was Joe Cartafalsa's talk on the "Viet Cong Stamps and Their Usage". 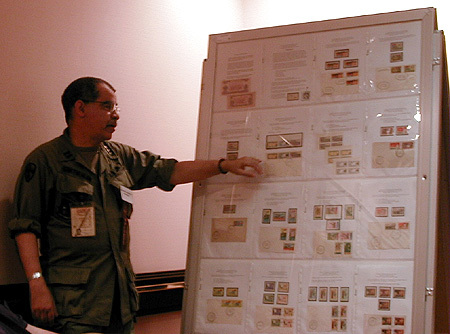 The presentation, which included examples of Viet Cong stamps, First Day Covers, postally used surcharges and Mien Nam markings and documents, was presented during the combined MPHS and SICP meeting Saturday afternoon. The meeting was well-attended, filling the conference room to near capacity. After the meeting a group of SICP members headed to a private room to discuss society business, share information and trade material. Saturday evening several of the members had dinner at a Vietnamese restaurant in the near by Eden Center.